differencemakers community blog: What are you doing that's better, different, or more unique than anybody else? What are you doing that's better, different, or more unique than anybody else? Differentiation: what your people do that others do, just better, differently or more uniquely. Discovery: ensuring your people know their gifts/talents and how you are helping them to enhance them. Drive: helping your people achieve what is important to them and meeting their intrinsic motivators. Delivery: how you create, capture and deliver value to all your stakeholders that they demand, desire, and feel that they deserve. Distinction: the ways the experience of your customers/clients online and in-person makes you stand out from the rest. 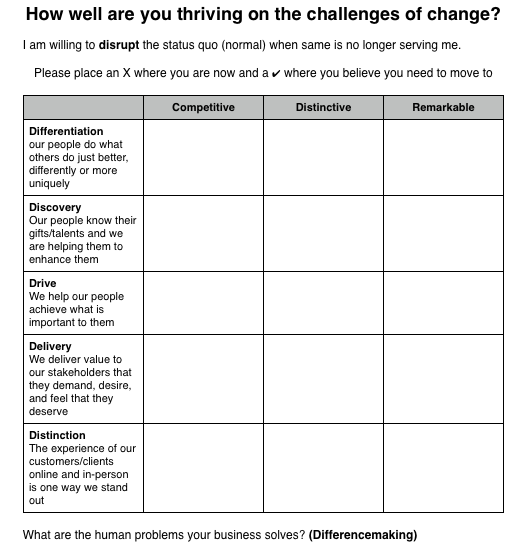 Differencemaking: the human problems your business solves. Often it's the little things that turn ordinary into remarkable. This week I went for a coffee with a client of mine in Warrnambool in Western Victoria, Australia. We walked past several coffee shops to get to his favourite one. No-one carries a card to be clipped and eventually get a free coffee here. 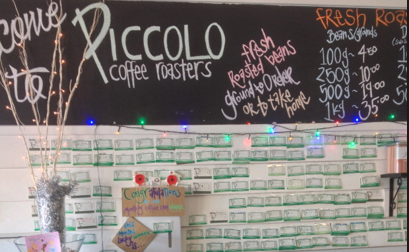 All the customers know where their card is on the walls, point them out, and the Barista ticks them off. I actually felt the sense of belonging regular customers have. This is the significance of small, a little thing making a big difference. And the coffee and the service were exceptional too. Differentiation is just one area you need to be remarkable in. How remarkable are you in the seven areas? Go to my website here and scroll down to the bottom of the page and you'll see the diagnostic below. Follow the instructions on my web page and I'll be in touch with you to arrange a complimentary high value briefing. It's my gift to you to help you to ensure that 2015 is your best year yet.